The Credentialed Alcoholism and Substance Abuse Counselor (CASAC) is an important professional in the addiction field. Cazenovia College is approved to offer the 350 clock hours of the Education and Training requirement for the CASAC credentialing. The 350 clock hours are offered as a certificate program in Alcohol and Substance Abuse Counseling for which students earn college academic credit. The coursework can be completed entirely online, on campus, or through a combination of both methods. Successful completion of the courses required for the Certificate in Alcohol and Substance Abuse Counseling allow students to meet the education and training requirements for the CASAC-T.
My experience with Cazenovia College online courses was wonderful. The online format is user friendly, accessible and efficient. Cazenovia College is one of only five colleges approved to offer the 350 hours of education and training completely in an online, distance learning format. Credits may be applied toward a Certificate in Alcohol and Substance Abuse Counseling. Credits may also be applied toward a Cazenovia College associate or bachelor degree in Human Services. The required courses are offered both online and on-campus. *Students may receive financial aid for the CASAC classes if they are concurrently enrolled in a Cazenovia College degree program. Students can apply online to the Center for Adult and Continuing Education. When applying, select the option to apply for a Certificate Program in Alcohol and Substance Abuse Counseling. Students alternatively have the option to Download and complete the Continuing Education Application Form (pdf). Once accepted, students will be assigned an Academic Advisor who will assist with course registration. 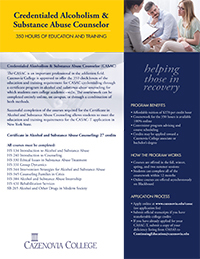 Students who complete the 350 hours of education and training through OASAS Certified Education and Training Providers are eligible to submit the CASAC/CASAC-Trainee application for approval to the New York State Office of Alcoholism and Substance Abuse Services (OASAS). Cazenovia College does not grant the OASAS credentialing. ** All students must submit a Certificate of Completion to OASAS and complete the CASAC/CASAC-Trainee application. Credentialing will be determined by OASAS. The New York State Office of Alcoholism and Substance Abuse Services (OASAS) is committed to enhancing the quality of services in New York State through the professional development of the alcoholism and substance abuse services workforce. To ensure that counselors who provide direct care in alcoholism and substance abuse programs are competent and ethical in their work and skilled in meeting the needs of today’s society, OASAS issues a professional credential, CASAC, to individuals who meet specific eligibility requirements and pass an examination. - pass the International Certification and Reciprocity Consortium (IC&RC) Examination for Alcohol and Drug Counselors. CASAC certification is specifically designed for individuals to work in an area related to alcohol and substance abuse treatment. With a NYS CASAC, one could work in an inpatient rehabilitation center, a halfway house, an outpatient addiction program, an assessment and referral program or in adolescent treatment. For more information about CASAC, please visit the OASAS website. **This program does not lead to professional licensure. Students in the internship course are not completing tasks that are restricted to licensed professionals. If you have any questions, or would like additional information, contact the Center for Adult and Continuing Education at ContinuingEducation@cazenovia.edu or call 315.655.7288.